Published September 28, 2016 By Anna T. This post may contain affiliate links. Regardless, I only recommend sites I've researched and/or used and trust. I found an interesting job lead today that I wanted to pass along to you. 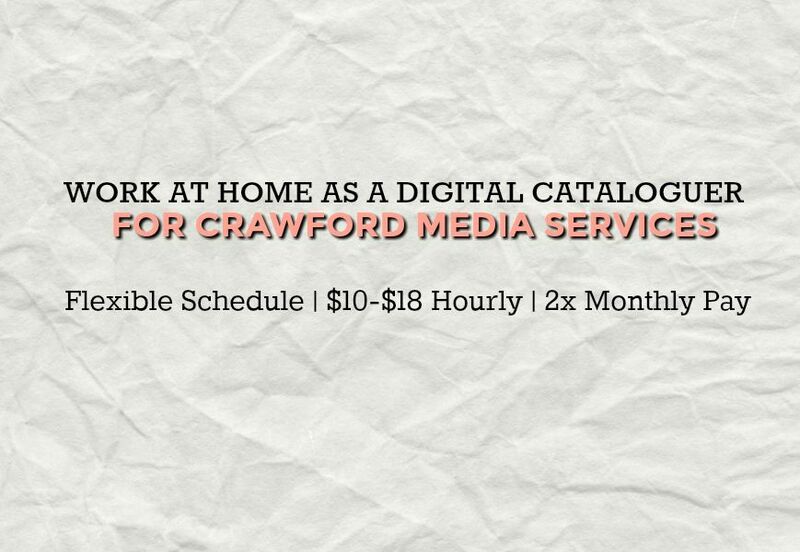 Crawford Media Services is currently hiring work at home digital cataloguers for Metaforce. Crawford Media Services is an old, Atlanta-based respected company that offers creative services like stock footage creation, QC, transcription, and metadata writing to many major film and TV clients, including The Walking Dead and PBS. Note that you must have a United States social security number to be eligible to apply. You can still work for Crawford if you live in another country, but are an American citizen. As a digital cataloguer, you will be writing and reviewing metadata for quality control purposes. You'll be trained for 4-6 hours before starting work. Training is completely virtual. You're required to pass a quiz/assessment before being hired. They prefer if you have some experience in cataloging or tagging, but it's not required. Copy editing skills, writing skills, research skills, and a familiarity with pop culture is necessary. This is a “work whenever you want” job, but you do have to meet a minimum of 20 hours per week and don't miss your deadlines. For every project, there are certain hourly quotas in place that you must complete or your compensation may be reduced. You'll be paid hourly, starting at $10 an hour with the potential to earn as much as $18 an hour. The amount will depend on the speed and quality of your work. There may be an opportunity to get promoted to administrator level, at which point you will be eligible for an increased rate of pay. Crawford will pay via Paypal twice monthly via either mailed check or direct deposit to your bank account. You can go here for the full details and also to get your application in/take the quiz. I also have a list of more non-phone jobs here. Is anyone working for them or in the same boat as I am? I passed their assessment and had contractor paperwork filed with them back in December, but have yet to hear from anyone regarding training and starting the job. I’ve tried contacting them but am not getting a reply. Thank you to anyone who can help. hello is metaforce available to international applicants? Hi, I don’t think it is. Does anybody know if there’s a maximum number of hours per week? Thanks for telling us about this opportunity with Crawford Metaforce. I’m passing this on! Hope you’re having a great week, Anna.